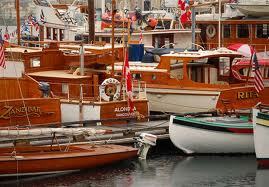 The Maritime Museum of British Columbia is proud to host the annual Victoria Classic Boat Festival! Join us on the docks to view 100+ classic boats, visit our floating exhibits, cheer on your favourite boats in the races, and take part in one of our many activities, workshops, and events! The Pacific Northwest on both sides of the border is blessed with an enormous number of traditional boats of all descriptions. The wonderful craft — both yachts and workboats — are cared for by their owners and a supportive community of boatyards, trades people, and admirers. ​We are also fortunate to have some amazing maritime non-profit organizations throughout the region, including the Maritime Museum of BC, Port Townsend Wooden Boat Foundation, SALTS, Seattle Centre for Wooden Boats, Cowichan Bay Maritime Centre, Victoria Tall Ships Society, Silva Bay Shipyard School and the Northwest School of Wooden Boatbuilding to name a few. These dedicated organizations provide opportunities for education, training, skills development and economic growth in our communities. The boat owners and those that support them are why we are still celebrating our maritime heritage after 41 years.